Click the button below to add the 2016 Lightweight Fernweg Weiss Edition Tubular Wheelset to your wish list. 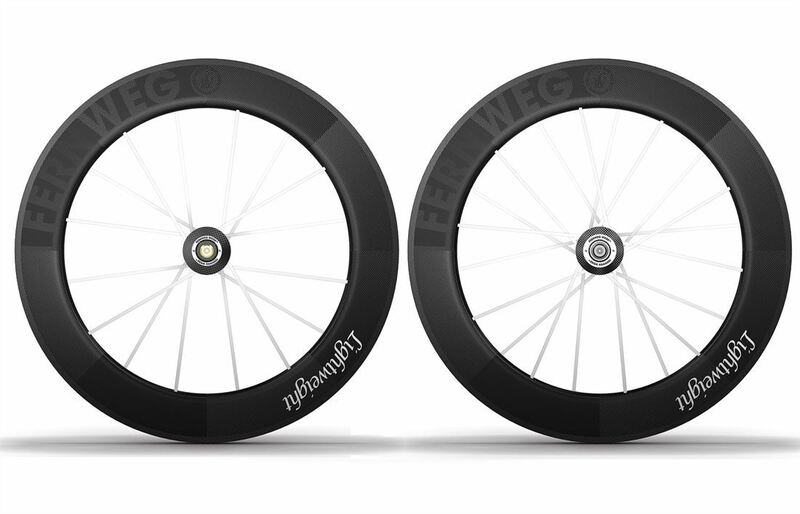 Lightweight's Fernweg Tubular Wheel would be light for a shallower section carbon tubular. It's light compared to a traditional alloy tubular. When you realize that the rims are 79.5mm deep, you know these are almost scary light for a wheel of this depth. Only they're built by Lightweight. Which means they're stiff and durable and aero. Lateral stiffness is something Lightweight prides themselves on; it improves efficiency, it improves handling. You'll feel it easier to climb, to slam the pedals, to turn. Lightweight utilizes carbon-fiber spokes, which are stretched and epoxied into place. The result is incredibly high and uniform tension, which makes the wheel extremely stiff and durable. They never need to be trued, they'll never lose tension, and you don't need to worry about them at all. The rear spokes are even wrapped with carbon-fiber at the crosses to further improve drive train efficiency. This is a little old-school thinking, aka tied-and-soldered spokes--adapted to modern day materials. Lightweight was early producing carbon-fiber wheels—they were already winning the Tour in 1996. They've had the time to figure out how to design a brake track that is predictable and powerful in the dry and wet. The latest lay-up, Gen 4, is an improvement over the impressive Gen 3, and the track runs cooler than it did before. They still recommend their own pad compound, as it works best and keeps everything covered by the warranty. The wheels come with a set of Lightweight brake pads produced by SwissStop. They also come with Lightweight steel quick release skewers (only 45g for the set), and a double-wheel bag. Lightweight strongly urges buyers to register their wheels on the Lightweight website within five days of receiving wheels. Each wheel has a unique ten-digit number that is encoded on a microchip embedded in each wheel. This helps you with both their crash replacement program and Wheelprotection program-and can come in handy if your wheels are lost or stolen. The first applies to all wheels and entitles you to 30% off a replacement wheel if you destroy one in a crash. The second is their insurance program, which means that by paying up front, your Lightweight wheels are protected for three years from any damage that might occur.